​1 TIME in 96+ LOCATIONS!!! 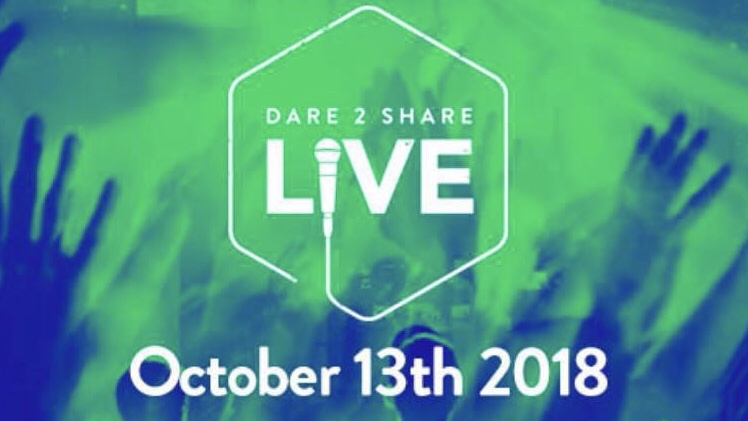 Dare 2 Share LIVE is fueled by area churches, senior pastors, youth pastors, youth workers, etc... who see value in ENERGIZING our local churches to MOBILZE our teens to GOSPELIZE their communities. During this event students will be trained and equipped on how to have gospel fluency and unleashed into specific areas of our community to have gospel conversation in a number of different ways. We believe that when teens are captured by THE cause of Christ, they are unstoppable! Dare 2 Share Live is a live, national, multi-site training, outreach event that is a teen led movement of gospel conversations from coast to coast. With high-energy inspiration, training and activation, it’s really more of a rally point for a revolution than a gathering. On October 13, 2018, teenagers from across the nation will gather together to bring Christ to their communities through service and gospel conversations, and spark a movement within youth ministry and within the Church at large. If you're interested in helping us PLAN, PROMOTE and PULL OFF this event, please out this form. Thank you! If you'd like for Pastor Tyree to meet with you view the calendar below and find a date and time marked "?Available" and fill out the form.